Ben Ryan describes the unusual events that led to a life-changing moment. THE FOLLOWING PASSAGE is an extract from Sevens Heaven: The Beautiful Chaos of Fiji’s Olympic Dream by Ben Ryan. Sometimes instinct takes over. Sometimes you just know, within the first two seconds. Sometimes a choice just seems right. And sometimes when you make that decision, you have no idea where it will end up taking you, of how the next 30 years has just flipped around on those two seconds, of how nothing in your life will ever be quite the same ever again. Late summer, 2013. I am 41 years old, a successful rugby coach, a man long married and with a big enough house in a good enough part of London. I have been offered a job that will provide a decent salary, long-term stability and just the right amount of stimulation. I am sailing untroubled waters, and the breeze is at my back. With one message from a friend, one 140-character post on Twitter, I throw it all away. For what? For a mere idea. Nothing solid, nothing planned, nothing with any guarantees. Just an idea, the first murmurings of a dream, the first note of a song yet to be written. I began as a player, became a teacher and grew into a coach. 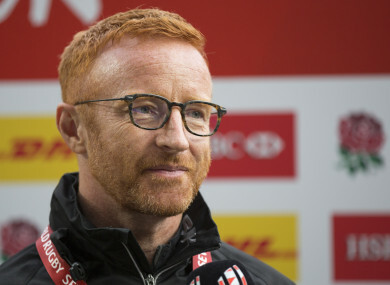 In seven years with England’s Sevens team I had taken them to World Cup finals and Commonwealth Games, building a reputation as an innovator, doing things differently, bringing in diets and training that no-one had seen before and making them staples of every other dressing-room. It had come to an end in the way these things often do: a new man coming in above who wanted to make his own changes, a sense of being let down by those at the top, a feeling that the time had come for something new. When UK Sport came calling, the support network behind Great Britain’s Olympic revolution, I was ready for it. More innovation, a chance for fresh starts and new horizons. Rural Buckinghamshire felt a long jump from London’s big-city buzz, but I hoped I’d get used to it. On the same day their confirmation came through – you’ve got it, when can you start? – so too did a text message. Each rugby nation has its special charms. New Zealand play with miraculous pace and precision. England are the aristocrats with the biggest house and the largest support. In Wales they marry the muscle up front with cavalier dash in the backs; Ireland use the wind and rain to pin you back and stretch you out. France, a smoking blend of menace and madness, Australia the attack-minded upstarts, Argentina, hard-nosed and flamboyant in equal measure. Don’t cross the South Africans, and don’t underestimate the fire that lights up in Scottish bellies. And yet none of them play rugby like the big men from the little Pacific nation, just as no-one plays football like kids from the Brazilian favelas, or no-one runs as fast as the boys from Jamaica’s boondocks, and nowhere is the beautiful chaos of Fijian rugby distilled in sweeter form than in its Sevens. Runners coming at you from everywhere. A conjuror’s sleight of hand on a bulldozer’s chassis. Side-steps and shimmies, battering-rams and blistering pace. Skips and dips, off-loads and smuggled-away passes, smiles and songs and a pleasure in it all as if the only things that mattered were having fun and cutting loose. All around the world, Fiji have always been every supporter’s second team. On the islands themselves, the players are the folk heroes and the warriors, the meal ticket and the great distraction from cruel poverty and relentless political instability. Every child on the islands plays, every adult is obsessed. They learn with anything to hand – balls of scrunched-up paper, empty plastic bottles – and often with nothing on the feet except wet red mud or golden sand. It is brutal and beautiful, intuitive and unstructured, both the spiritual home of the short-form game and a quarry mined relentlessly by greedier, richer nations, the best players enticed overseas by pro contracts and short naturalisation periods, Fiji itself left to battle on with minimal resources, shoddy equipment and compromised coaches. You cannot ignore Fiji. You cannot prevent your heart doing a little jump at the mention of a coaching vacancy, or your mind racing ahead with the possibilities and problems, and how you, of everyone that’s been tried, might be the one to unleash all that untapped potential. You take a breath. I had a winning record for England against Fiji. I knew that gave me clout. I knew too that serendipity was at my side; while Fiji had never won an Olympic medal of any colour in 60 years of trying, the next Olympics in three years’ time would feature the return of rugby for the first time in 92 years, and in the seven-a-side version for the first time ever. So of course I was going to email them, missed deadline or not. No need for a CV, simply an expression of interest, and an email came back: can you do an interview over Skype at two in the afternoon, Suva time? Two in the afternoon in Fiji’s capital is two in the morning in London. Fine. I like espresso, so staying up late was no problem. I did a little basic prep: I knew the current team’s strengths and weaknesses, so I could talk about those with authority; I knew it would be madness to try to change the way they played, but I knew too that if I could add a framework, to make them consistently brilliant rather than intermittently outstanding, and get them fitter and even faster, and put in selection strategies that weren’t just based on who you knew and which province you came from, I could make a difference. If I could convince the blazers of that too, it might get interesting. At 2am I was wide awake and good to go. Two hours later, they actually called. Okay, I can now hear milk-floats outside, and the coffee has worn off, and my eyelids are starting to go. The video kicked in. I was being projected onto the wall of the CEO’s office, and I had the sense this was not established procedure. People who were not board members, people who seemed uninvolved in the actual interview, kept popping their heads in to have a look and say hello. I was repeatedly asked if I knew Jonny Wilkinson, the great hero of England’s World Cup win of 2003. I thought it went okay. I asked a few questions; I didn’t fall asleep. The following morning, late after a long lie-in, I went on to the internet, keen to learn more about Fijian culture and life. The first headline I saw on the Fiji Times website announced that the CEO of the FRU had been sacked. Right. Game over before the game had begun. The little spark had been snuffed out. That was Fiji for you, and Fiji would clearly be for someone else. Loughborough would be my new playground. That would be fine. Part of Britain’s push to the Rio Olympics, medals an indirect result of what I would be trying to do. Two weeks later, sitting in an Italian restaurant in south-west London with my wife Natalie, my mobile started ringing. I recognised the dialling code. +679. Fiji. I jumped up and strode outside, into a little side road that ran towards Richmond green. It was a warm evening, still light at 8pm, well-heeled Londoners out for a gentle strolls, others throwing Frisbees about on the grass, comfortable lives and solid wealth everywhere you looked. A silence, a rushing in my ears. I walked slowly back into the restaurant, red tiles on the floor, carefully exposed brick walls, contentment and inertia in the air. There was so much easy affluence that the décor had been designed to look shabbily chic – tables like old school desks, carefully tatty wooden chairs, old leather books on the shelves. Thick-rimmed wine glasses in front of us, a bottle of Valpollicella half-drunk and ready to be poured for more. We talked first about the sensible stuff. Moving to a place neither of us had ever been to before. Moving thousands of miles from friends and family, from one of the world’s great cities to a nation whose population could have fitted into one London borough. We talked about Natalie’s job, about how she wasn’t enjoying it that much. We talked about commitment and changes of heart; I hadn’t yet signed a contract with UK Sport, I still had time to give them a grateful no thanks. We talked about the possibility of keeping options open, of going over there for a look, of simply flying home if it wasn’t working and felt like it never could. We talked about all that. But instinct had already kicked in. Berlin had given me 20 minutes; I‘d known after two seconds. Sevens Heaven: The Beautiful Chaos of Fiji’s Olympic Dream by Ben Ryan is published by Orion Books. More info here. Murray Kinsella, Gavan Casey and Andy Dunne preview a big weekend of Heineken Cup action and dissect the week’s main talking points. Email “'My mobile started ringing. I recognised the dialling code: +679. Fiji'”. Feedback on “'My mobile started ringing. I recognised the dialling code: +679. Fiji'”.